This section provides a brief overview of results from linguistics and cognitive psychology concerning the dimensions of affectivity and the ways in which attitudinal and emotional information is expressed. Communication depends crucially on information about speaker attitudes and perspectives, and hearer inferences about that information. "Sam bought that damn bike." Frustration: I've been trying to discourage Sam from wasting $6,000 on a bike he doesn't need. Exuberance: I've been hoping that Sam will buy the $6,000 road bike so that I can try it. Our understanding of what is conveyed by damn in this (or any) case depends on what we know about the speaker, the hearer, and their relationship, their goals and preferences, and the information they have already exchanged about the topic in question. That is, apprehending the sentiment is as deep a problem as cognitive science has to offer. A single classifier model (MaxEnt) applied to three different domains at various vocabulary sizes. panglee is the widely used movie review corpus distributed by Lillian Lee's group. The 20 newsgroups corpus is a collection of newsgroup discussions on topics like sports, religion, and motorcycles, each with subtopics. spamham is a corpus of spam and ham email messages. Part of the challenge is that sentiment information is blended and multidimensional. We try to approximate it as a classification problem, but this is often inappropriate. I think no social networking site brings out this fact more clearly than the Experience Project, where users upload stories about themselves that are often impossible to categorize, since they involve a wealth of different kinds of sentiment information (and elicit correspondingly complex reactions from readers). Table tab:ep provides a few examples of texts that really ought not to be classified along any single emotional dimension. Emotionally blended 'confessions' from the Experience Project. I fell over in the playground this afternoon, in front of all the parents and kids. I fell backwards over a cone. It was pretty funny, but now my neck hurts like crazy. I really hate being shy ... I just want to be able to talk to someone about anything and everything and be myself.. That's all I’ve ever wanted. 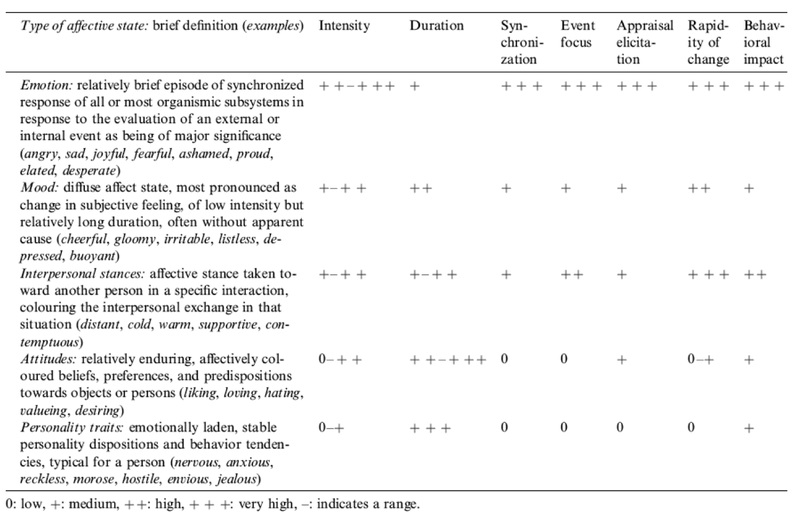 Scherer's (1984) typology of affective states (figure fig:affect) provides a broad framework for understanding sentiment. In particular, it helps to reveal that emotions are likely to be just one kind of information that we want our computational systems to identify and characterize. Scherer's typology of affective states. 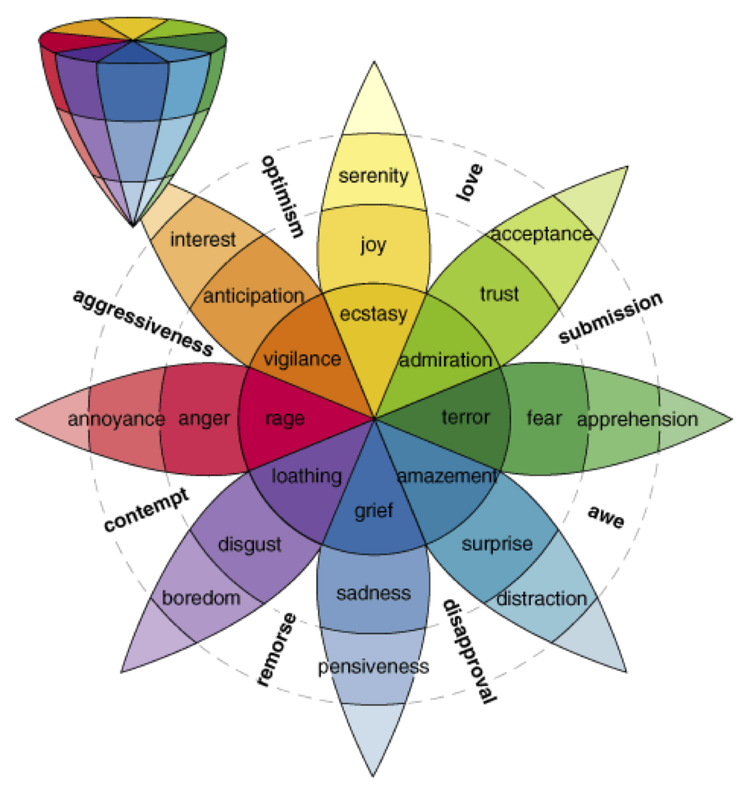 Plutchik's (2002) Wheel of Emotions (figure fig:wheel) is a proposal for how to relate emotions to one another. It's also helpful for the color scheme it provides, which can inform visualization choices. 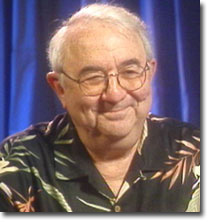 Ekman's (1985) theory of emotions is based in facial expressions but is intended to have broad applicability; see figure fig:ekman. 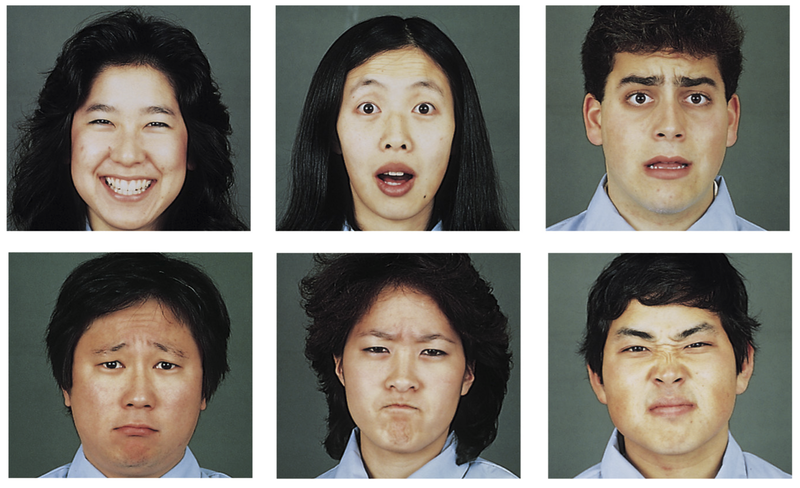 Ekman's six basic emotions, as expressed by the facial muscles: surprise, happiness, anger, fear, disgust, sadness. It's often important to distinguish author from reader perspectives, as these are likely to elicit different emotions. Some examples are given in table tab:reactions. Of course, we might see many other combinations as well, but these are prominent on social networking sites. Likely pairings of author states and reader reactions. What linguists discuss under the rubric of social meaning includes a lot of Scherer's interpersonal stance and emotional traits. Speaking in the social world involves a continual analysis and interpretation of categories, groups, types, and personae and of the differences in the ways they talk — in social cognition terms, a development of schemata (Piaget 1954). These emerge as we come to notice differences, to make distinctions, and to attribute meaning to them. Thus we construct a social landscape through the segmentation of the social terrain, and we construct a linguistic landscape through a segmentation of the linguistic practices in that terrain. Dialects: where does the author come from, and how does that affect how I apprehend her message? Literacy levels: is the author educated, and does that matter in this context? Slang and jargon: is the author at home in this context? Does she possess specialized knowledge? Is she a true insider or a pretender? There is an additional layer of complexity: for some of these signals, we send them intentionally in order to convey extra meaning. Others just seep out because they are not under our control. A lot of sentiment information is highly context-dependent. When I think about my own understanding of the words and phrases of my native language, I find that in some cases I am inclined to say that I know what they mean, and in other cases it seems more natural to say that I know how to use them. Keeping track of perspectival information is essential for robust utterance understanding. This is particularly true for evaluative language, which is always interpreted from some kind of subjective position. The following quotation from Lasersohn 2005 also points out how complex the relationship between sentiment and subjectivity/objectivity is, in that even our subjective claims are meant to have some broad applicability beyond our own preferences. While shopping at one of my local Apple stores the other day, I overheard an earnest conversation about safeguarding Mac computers against things like viruses and trojans. The customer and companion were new to Mac life and were convinced that they should be very worried about viruses. The Apple salesperson on the floor repeatedly assured them that they would not need extra antivirus protection for their Mac. The customer then argued that Symantec makes an antivirus program for Macs, therefore, it must truly be a credible threat, otherwise there would be no such products. Some antivirus products are even sold in Apple stores. I’ve heard similar arguments before: if companies like Symantec or McAfee make antivirus applications for the Mac, then Macs must truly be vulnerable somehow, somewhere. Steve Jobs and the rest of the Apple cronies must be lying. From Antivirus Programs for Mac, Snake Oil or Public Service? What's with these friggin QR codes? He knows it is wonderful. No one found it to be wonderful. They said it would be wonderful, but they were wrong: it was awful! This "wonderful" movie turned out to be boring. 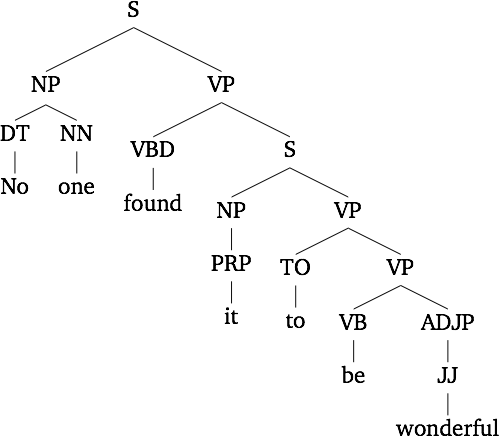 In linguistic semantics, these influences are analyzed in terms of semantic scope: in the interpreted structure of these sentences, the word wonderful is in the semantic scope of operators that variously negate its scalar meaning or allow the speaker to back off of the semantic meaning. Figure fig:scope begins to suggest how this can be analyzed in terms of the graphical structure of the underlying sentence. 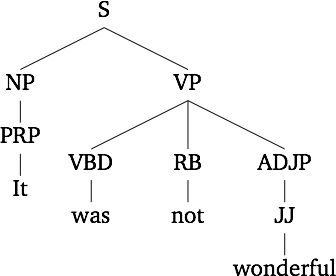 Syntactic structures. The sentiment word wonderful is influenced by the operators that take scope over it, which alter or weaken speaker/author commitment. The effects of non-literal language are extremely challenging. Even humans are apt to get confused about the intended meaning of some expressions of this form. We can hope to approximate their effects with sentiment analysis systems, but they are still likely to be a leading cause of errors. Implicit comparison: He did a good job for a linguist. Hypallage: He's not exactly brilliant. Hyperbole: No one goes there anymore. Sentiment is blended and multidimensional. Author and reader stances often contain very different but related sentiment information. Sentiment is linguistically and socially complex: ideally, we would know who was talking, to whom, and why, before venturing a guess about their attitudes and emotions. Sentiment is context dependent: the same string might be sincere in one context and wryly ironic in another.